It is situated on the old Dublin entrance to Castletown House, now a quiet country lane. It is far removed from the hustle and bustle of normal every day life. A perfect place to relax while still being able to get in to Dublin city within an hour.Conservation of Batty Langley Lodge was 100% funded through OPW. We loved staying here. Arranging arrival with Teresa was easy and she was so welcoming. Te lodge is fanstic and had everything you might need for a stay. The grounds were beautiful and the lodge was completely silent at night. No wifi and TV meant we weren't even tempted to connect with the busy world outside. We're delighted to hear you really enjoyed your stay in Batty Langley Lodge and that you had the chance to get that digital disconnect and just take in the peaceful surroundings. Thank you so much for taking the time to leave your review and we hope to welcome you again in the future. In such a high tech world now for us it was a step back in timer off pure relaxation and peace and quiet to reflect and slow down . Thank you for taking the time to let Irish Landmark Trust know how your stay at Batty Langley Lodge was. It is wonderful to hear that you were able to truly switch off from the modern world and relax into the Irish Landmark experience. We do hope to perhaps welcome you back to another property in our care sonn. and tranquil ,and as I said if only the walls could talk.. Imagine all the stories if Irish Landmark properties could talk! That would be volumes and volumes worth of fantastic reading there! Great to hear you had a lovely time at Batty Langley. Thank you for supporting Irish Landmark Trust with your stay at one of our 32 properties located around Ireland and Northern Ireland. Great views. Super comfortable. Our host was so sweet and gave us ideas to see in Dublin. We had everything we needed. Delighted you were well looked after and enjoyed your stay at Batty Langley Lodge. Thank you for supporting the work of Irish Landmark Trust by staying in one of our properties. We do hope that you will perhaps try another of our 31 self catering accommodation properties located around the island of Ireland. So much fun to stay in a historic dwelling! Unusual and in great condition! Much better story than staying at any old hotel! Thank you for choosing to stay at an Irish Landmark Trust property and it is wonderful to hear that you had such a great time staying at Batty Langley Lodge. As a guest you are helping us in our mission to save, share, and sustain Ireland’s built heritage. You are now part of a community that’s helping to keep heritage alive. Thank you for your great support and we do hope to welcome you back again in the future. We got the lodge in beautiful weather so dining outside in the evening sun was delightful. It is a wonderful location and the building is really charming. It is very well equipped but like many Landmarks it was a touch rough round the edges. Having Castletown park virtually to ourselves in the mornings was great. So great to hear that you had a lovely time at Batty Langley Lodge and got to enjoy the property in such glorious weather. What a fabulous summer to experience the property. May I ask you to please contact Irish Landmark Trust directly please about your comment "touch rough" as we would wonder as to what you mean by this and would like the opportunity to address any comments if possible. If you reply to your booking confirmation email that will get you in touch with Head Office. Thank you. An eighteenth century lodge, full of character. A very enjoyable weekend in Batty Langley's Lodge, a fascinating eighteenth century "gothick" house, full of character. It was very comfortable and welcoming. We found it ideal for exploring the Leixlip and Maynooth areas, and it was good for visiting the Castletown house and estate. Thank you for staying at an Irish Landmark Trust property. It is wonderful to hear that you had a nice time at Batty Langley Lodge and found the property welcoming and comfortable for your time there. That you for your support in the work that we do trying to save more of Ireland's built heritage. We enjoyed staying in this unique and quirky property. We have rented other National Trust properties and Batty Langley Lodge was as described. Really enjoyed another stay at Batty Lodge. Teresa is a wonderful property manager and nothing is too much trouble for her. I loved the long evenings when the gates were locked and I could venture out into the park alone hunting for bats. The weather was super and there was little need for heating, except for a quick blast later in the evening. At times, during the day, the public were a little intrusive. They peered in through the windows and if a door was ajar they often barged in to see the interior. Thank you very much for the great review. It's always great to hear of our guests thoroughly enjoying the experience of staying in an Irish Landmark Trust property. Teresa is indeed a wonderful Property Manager and I'm sure you were very well looked after. 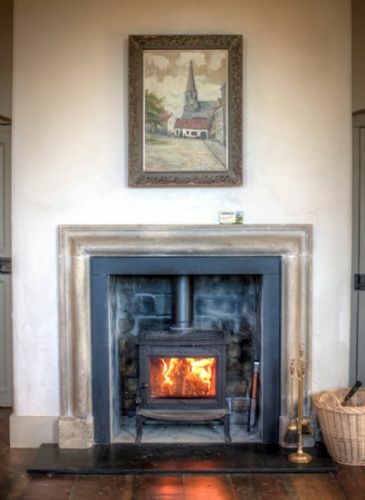 The wonderful thing about Batty Langley Lodge is that during these long warm evenings it's great to do as you did and go wandering for bats and enjoying the beautiful weather and during the darker winter months it's the most cosy place to be and just curl up by the fire. We hope you can come stay with us again soon! 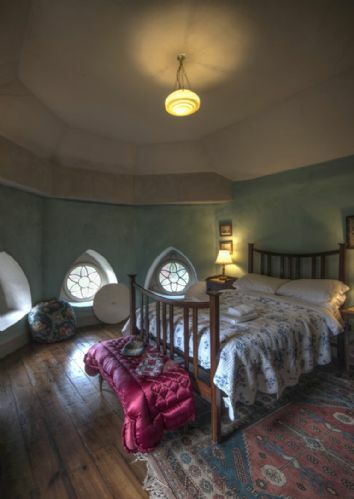 The Irish Landmark Trust is to be commended for the conservation of historical properties and for making them available as holiday accommodation. We had a pleasant stay at Batty Langley Lodge. It provided us with a base to tour the region, including Dublin, Glendalough and even Clonmacnoise. The peace and quiet of the place was lovely, with walks into Celbridge along the Liffey and to Castletown House. The cottage was provided with all the necessary appliances, although no TV or wifi. There is free wifi at the cafe in the nearby shopping centre on Celbridge Road, for those who do not have their own mobile data. We would certainly recommend Batty Langley Lodge for other guests wishing to get away from it all. Thank you for your kind words about the work the Irish Landmark Trust endeavor to do. 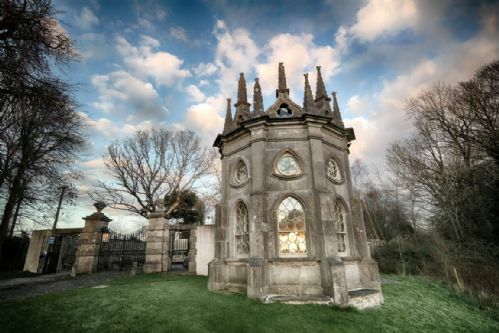 It might not feel like your holiday is anything but a relaxing indulgence, but when you stay in an Irish Landmark property, you’re part of a community that’s helping to keep heritage alive, so thank you for booking to stay at Batty Langley Lodge. Thank you for recommending this property to other guests. We loved our stay at Betty Langley lodge: it’s the perfect place for a romantic couples’ getaway. Secluded, beautiful, romantic little hideaway on the edge of Castletown Estate. Breakfasts with the half-door open, listening to the chattering birds in the forest; evenings, glass of whiskey in front of a roaring fire and listening on the bat monitor to the creatures wheeling about the lodge at night. If you love heritage, nature, and special (but not 5-star perfect) history-laden places this is the perfect retreat-from-it-all haven. Delighted that you had a lovely time at Batty Langley Lodge during your recent stay. We do hope to welcome you back to another Irish Landmark Trust property in the future. Once again we had a perfect stay at an Irish Landmark Trust property. Batty Langley will be hard to beat, a characterful property in an idyllic location. Thank you Kerry for your continuing support for Irish Landmark Trust. It is always wonderful to welcome back people who truly understand our ethos and our mission to save, share, and sustain Ireland’s built heritage. It snowed but we were toasty warm! Everything was great but you really need to change the bath to a shower! I'd recommend booking dinner in "Canteen", excellent restaurant in Celbridge. Thank you for getting in touch and your recommendation of a shower, however many guests prefer the bath at this property. It would be wonderful to have both but I am afraid the property is not large enough for this. If you prefer a shower please do get in touch with us directly next time and we can let you know what properties have a shower in them. Located down a narrow country lane on the edge of a parkland, Batty Langley is the best of both worlds—off the beaten path yet walkable to retail, restaurants, and transportation. Sitting on a knoll with a view of the river, the house is like a tiny castle. Inside, the rooms have all the quaintness and coziness you might want from a cottage in Ireland. As you said, Batty Langley Lodge is in such a great location with direct access to the grounds of Castletown House. Combine that with a stunning property full of character and history and you've got a very special place indeed. We're delighted to hear you were so cosy and that you had such a pleasant stay. Thank you for the lovely review. We would love to welcome you back to stay with us soon. Thank you so very much for supporting Irish Landmark Trust by staying at Batty Langley Lodge. Delighted you had such a lovely stay and were well looked after. We would be delighted to welcome you back to this, or another Irish Landmark Trust property in the future. You are dead right! Batty Langley Lodge is perfect for a quiet, relaxed and technology free stay. It's also very close to Dublin and even closer to the town of Celbridge so you're never too far to do a little shopping or maybe go for dinner and drinks. Thank you very much for the great review and we hope you come stay in an Irish Landmark property again soon. Spent two very peaceful nights in Batty Langley Lodge in the cold end of autumn. I felt so comfortable and at home while sitting with a glass of wine and a book in front of the fire. The lodge itself is beautiful and full of character. The bed was comfortable and the place was spotlessly clean. A big thank you to Teresa the House Manager who was really helpful and so friendly! It's a really special feeling staying in an Irish Landmark property and I look forward to trying every property I can. Thank you for your lovely review regarding your recent stay at Batty Langley Lodge. It is always lovely to hear when guests really have the chance to enjoy a true Landmark experience by simply relaxing and getting away from the busy modern world, whilst at the same time helping Irish Landmark to continue to save Ireland's built heritage. Teresa is wonderful and we are very lucky to have her as Batty Langley Lodge's House Manager. We look forward to welcoming you back again to another Irish Landmark Trust property in the near future. I had a lovely stay at the lodge with my cousin and little daughter. The lodge was perfect for a nice quiet retreat and we loved having the fire lit and the radio on in the background. The location was really good, really nice walks to go on and all from the door of the lodge. I would highly recommend this lodge to anyone looking for an escape from the Dublin and an added bonus is that its not too far from it. My daughter was fascinated with the building itself and it was so enjoyable to sit down and play board games with her in the comfort of the lodge. Thank you for supporting Irish Landmark Trust. Delighted to hear that your stay at Batty Langley Lodge was a cosy and quiet retreat for you. Looking forward to perhaps welcoming you back in the future to one of our other properties. Looking forward to staying at other Irish Landmark properties next time. Thank you for letting us know how much you enjoyed your recent stay at Batty Langley Lodge. Wonderful setting for your stay over Halloween. Looking forward to welcoming you back to another Irish Landmark property in the future. Do not forget that as a repeat guest you will be offered a discount so make sure to contact the Bookings Office when making your next reservation. The perfect hideaway that feels like you're in the country miles away yet only 40 mins from Dublin. Simple yet gorgeous old building. We're delighted you enjoyed your stay in Batty Langley Lodge. It really is nestled away in such a beautiful quiet place and with the grounds of Castletown House to explore on your doorstep. Thank you very much fro taking the time to leave your review. I took my Fiancé to Batty Langley lodge for a surprise weekend away after we got engaged. I can't say enough good things about it. It was a wonderful little haven, so warm and comfortable. The perfect place to relax, we went for walks in the grounds of Castletown park at dusk with the bat detector and we went into Celbridge at night for cosy drinks in the local pubs. The silence at night time was total, no cars and no people around, you just don't get that anywhere else. I would highly recommend Batty Langley lodge. A huge thank you to Teresa and Lorraine the managers they were wonderful. Delighted to hear you had such an enjoyable experience in Batty Langley Lodge. It really is the perfect place to spend these cold autumn evenings. The grounds of Castletown House are such a beautiful place to wander through on your way to the local pub for those cosy drinks too. Thank you so much for the wonderful review and congratulations on your recent engagement. Excellent booking process by telephone at short notice. On arrival we were met by Teresa who filled us in on the local history and gave us tips for our visit. We enjoyed the Castletown House tour and especially the coffee shop. Most of all the sense of tranquility and calm atmosphere, especially in the evenings. I would highly recommend this property to anyone wanting a break away from the hustle and bustle of daily life. Thank you so much for the lovely review and recommendation. Batty Langley Lodge is indeed a beautiful and tranquil place. We're so glad you enjoyed the peace and quiet of the Castletown House and the surrounding area. You're more than welcome to come stay again at any of our beautiful properties. It is a beautiful building in a great spot. The bedroom is very special and we loved having the slow combustor fire going in the spacious longue room. We enjoyed cooking in the kitchen. It is very homely. We loved walking around the grounds which are vast. We appreciated being able to go out and explore different parts of it at different times and so do it in a relaxing way. The other people enjoying the parklands seemed just a part of the whole experience and we never had anyone intrude upon us in the lodge. Castletown House was well worth a visit as was the town of Celbridge- it has retained a village feel about it and we also found great coffee there. It helped us to really unwind to be in the lodge. It was also a very short drive with not too much traffic going to the airport for us which was a great way to end our stay. Wonderful to see you had such a lovely time at the charming Batty Langley Lodge at the end of your trip to Ireland. It's location to Dublin Airport is very handy alright so great to hear you found it convenient. Thank you for letting us know about your stay. Thank you for your recent review of your stay at Batty Langley Lodge. Delighted to hear you had a nice stay. The history and location for this property is awesome. We enjoyed the grounds of Castletown and being able to walk into Celbridge. It was also an easy drive to other sites we wanted to visit. My only suggestion to improve Batty Langley is to re-think the bathroom. Yes I know it's an old property and the original would not have had a bathroom. But I think that if you were to remove the bath install a proper shower and tile the walls this would greatly enhance the place. Also by tiling the walls the fabric of the building would be much better protected. As it is the plaster on the walls in the bathroom is cracking and ready to fall into the bath. This is not meant as a criticism it is hopefully taken as a positive point and one that is intended to provide longevity to this marvellous building. Thank you for your review and suggestion. 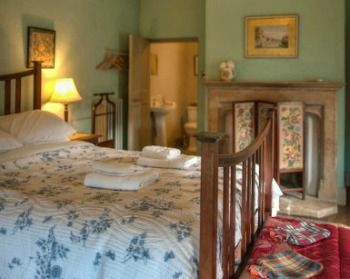 The reason there is a bath in Batty Langley Lodge is primarily to ensure that the structure itself was not compromised. The only way to put in a shower into where the bathroom is located would be to block off a window which is a beautiful feature of this property. I have forwarded on your review to the Standards Officer who will be able to address the issue you have raised. I do hope that you will come again to another Irish Landmark property in the future. Batty Langley House was comfortable and fun to stay in. It has a beautiful view of the bucolic landscape and easy access to one of Ireland's most storied estates, Castletown House, a surprising bonus for us. Great to hear that you had a fun and comfortable stay at Batty Langley which is situated on the famous and historic Castletown Estate. Hope to see you back perhaps at another Irish Landmark property. We loved our stay at Batty Langley. It is such a quaint cozy little place. We brought our dog Poppy with us. She learned how to swim for the very first time and absolutely loved every minute. The grounds are beautiful too. The only slightly negative thing was the lack of privacy we got due to countless people walking up to the window and staring in. Perhaps there is something elegant that that can be applied to the windows (like a stainglass effect) to prevent outsiders constantly looking in through the windows? Thank you for your feedback, we are really delighted you enjoyed your stay, come back again soon. Meine Gastgeber waren äußerst nett und hilfsbereit. Das weitläufige Gelände ist wunderschön. Die Lodge ist sehr gemütlich. Mülltüten, Geschirrspülmittel, Handseife und vieles mehr waren vorhanden. Ebenso gab es ein Fernglas und einen Fledermausdetektor :-). Geschäfte zum Einkaufen sind gut zu Fuß erreichbar. 13 Minuten Fußweg bis zur Busshaltestelle. Eine Stehlampe war verbeult, für das Vorhängeschloß am Eisentor, das zum Schuppen (mit Mülltonnen) führt hatte ich keinen Schlüssel. Das war aber kein Problem, nur etwas umständlicher, weil ich auch andersherum gehen konnte. Der Schuppen ist sehr eng, deshalb muß man die großen Mülltonnen einzeln herausrollen, um den Müll entsorgen zu können. Das ist etwas umständlich. Es wird viel Wert auf Energiesparen gelegt, deshalb gibt es viele Sparlampen mit kaltem, ungemütlichem Licht. Dafür gibt es aber einen Wäschetrockner, der viel mehr Strom verbraucht, als ein paar klassische Glühbirnen. Leider war alternativ kein Wäscheständer zum Trocknen der Wäsche vorhanden. Die Klappstühle für den Garten sind teilweise schon sehr wackelig und der Tisch oder die Tischplatte vom Küchentisch schaukelt. Bei der Doppelsteckdose in der Küche funktioniert nur die eine Seite. Nicht alle Heizkörper können einzeln reguliert werden, weil teilweise die Drehknöpfe fehlen oder defekt sind. Es verging kein Tag, ohne dass Leute sich laut direkt vor dem Gebäude unterhielten und häufig sogar in die Fenster starrten. Da ich mich viel im Wohnzimmer aufhielt um zu lesen oder zu lernen, war das sehr lästig. Die Steigerung war noch, dass an mehreren Tagen Kinder mit Steinen auf das Gebäude warfen, lange an die Tür schlugen und "Open the door" brüllten. Alleinsein im Garten war auch nicht möglich, weil einige Leute auch so weit wie möglich um das Gebäude herumgehen und auch dort hineinsehen. Ich hatte ein wenig das Gefühl in einem schönen Zoogehege zu leben :-(. Wenigstens hatte ich in der Küche (dort hatte ich permanent das Rollo zur Wegseite geschlossen) und im oberen Stockwerk einiges an Rückzugsmöglichkeit. Trotzdem hatte ich alles in allem einen schönen Aufenthalt. Falls ich wieder einmal eine schöne Unterkunft in der Nähe von Dublin suche, würde ich mich wahrscheinlich für das Castletown Gate House entscheiden, das nicht so auffällig aussieht und deshalb nicht so viele neugierige Leute anzieht. We enjoyed staying at a place with so much character and history. Terasa was very knowledgeable about the area. Thank you for this review, we always like to hear what our guests think, come back again soon. Batty Langley is in a great location, particularly if you like river walks with or without a dog! The nearby town has good pubs especially Castletown Inn with its great Guinness and some good restaurants, in particular, Da Mario's for good Italian food. There are also interesting places to visit locally, such as the Castletown House itself and the National Stud, Kildare. Thank you for your feedback, really delighted you enjoyed your stay, would love to see you back perhaps at another one of our properties. Lovely property but wrong timing. 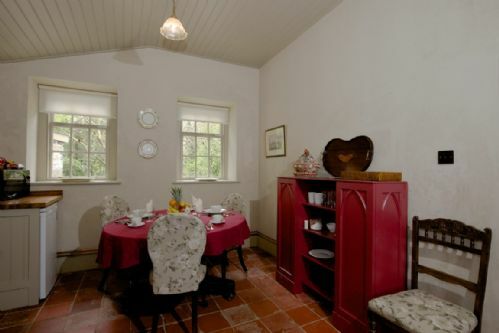 We stayed Saturday and Sunday nights in the quaint Batty Langley's Lodge which accommodates two people comfortably. We were warmly welcomed by Ciaran (Teresa's husband) who showed us where all the necessities and local amenities were located. Private parking for one vehicle is available within the grounds of the property and there is a public parking facility for 3 to 4 cars outside the entrance gate. It is advisable to reverse into the private parking space as it can be difficult to negotiate your way in and out when the public parking is in use. Also be prepared to have curious visitors looking in through the downstairs windows! We made use of the stove in the sitting room which had a plentiful supply of firewood etc. and it created a lovely atmosphere at night time. Castletown House is about a 20 minute walk through the grounds partly along the Liffey River and is well worth a visit. Thank you for taking the time to let us know how you enjoyed your recent stay at an Irish Landmark Trust property. We are glad to read that you had a nice stay. Batty Langley Lodge is located at one of the entrance gates to the Castletown Estate so there are walkers that do pass by the property on a regular basis. It is such a striking building architectural wise that understandably people do tend to be curious about the property but I am glad to hear that you stay in the property itself was not too put out by people passing by. Thanks to the Irish Trust for making Batty Langley Lodge available. The gatehouse and setting are really unique! Thank you for taking the time to write this review, we are glad you enjoyed your stay, come back again soon. The Lodge is a little treasure, Peacefull and full of silence in this fast running world. For a couple, that loves the nature and the historic in this building, it´s the absolutly right way to stay. We really, really enjoyed it. An excellent retreat from the hustle and bustle of working in and around Dublin City without having to travel too far. Batty Langley Lodge house is perfectly located at the edge of the Castletown House and grounds which were a joy to explore, including the walkways along the banks of the Liffey. Civilisation is close at hand if / when required via a 15 min stroll to Celbridge through the estate. The lodge house itself is quirky in design but well appointed with views along the Liffey valley. Good for a digital detox away from tv and wifi with plenty of books and a log fire (not required this trip) to supplement modern central heating. Thank you for taking the time to let Irish Landmark know how you enjoyed your stay. We are delighted you had a nice time. Hopefully we will have the opportunity to welcome you back to another Irish Landmark Trust property in the future. Super interesting and historic place to stay. Batty Langley is not a 5-star hotel, but if you are looking to stay in an interesting bit of history, in a beautiful place, connected to an even more beautiful place, stay here. No real shower, but they could make one with very little change in the bathroom. We stayed three nights and recommend it. It's in a quiet little corner of the Castletown estate, with a short hike to Castletown itself, and a short hike to town, too. Nice. Thank you for your feedback, glad you enjoyed your stay. This property is the perfect therapy for escaping the mad world we live in now. Literally stepping back in time, being surrounded by books from bygone days, and games we used to play in our childhood, before TV and Wi-FI came along and took away our ability to chat and enjoy the simple things. Batty Langley lodge makes you realise that the trappings of the 20th Century are just that. Teresa keeps the place spotless and provided everything we needed with a smile. She let us in at 1pm, rather than 4pm, and even left us an Easter egg as we stayed over the long Easter weekend. If you are at one with nature it is a wonderful place, as birds and bats keep you company day and night, and on our last day we were visited by a Mink who slept in the crook of a tree just outside the house. Thank you for the lovely feedback, we love to hear comments from our guests, would love to see you back in the near future perhaps at another on of our properties. After a difficult time, with the death of a relative, I retreated to the Lodge feeling tired and dejected. Once again Batty worked her magic and after a few days of walking and relaxing in her care I was beginning the healing process. Thank you for taking the time to write this review, really delighted you had a nice relaxing time at Batty come back again soon. Myself, my wife and our dog stayed here for a weekend in March. From the very start, we were impressed with the friendliness and helpfulness of the service. Cottage itself is even better in person than in the pics and situated on fabulous grounds - great if you bring a 4 legged friend! We had a great time and, if you stay here, be sure to check out the restaurant Canteen in nearby Celbridge - fantastic find. Thank you for taking the time to write this review, we are really delighted you enjoyed your stay, would love to see you back in the near future. really enjoyed the very quiet weekend - perfect for a romantic break and time away! will be back again soon! Lovely lodge with a great cosy living room and all you could want for a romantic stay. We had a great time at the Batty Langley Lodge - prefect for what we wanted, a quiet get-a-way after the Christmas madness! It is a little pricey but the uniqueness of it all was worth it! Thanks you Teresa, for your help and for a lovely stay! We had a lovely, quiet stay at Batty Langley. It was very comfortable and warm & cosy. It had a FAB backgarden - the Castletown House estate! It was unique and historical place to stay - as are all the Landmark Trust locations. Thank you for taking the time to write this review, really delighted you enjoyed enjoyed your stay, would love to see you back perhaps at another one of our properties. Absolutely loved our stay at the Lodge, my boyfriend actually specified it was one of his favorite parts of our 3 day stay in Ireland. The grounds were gorgeous and we felt secluded enough but still near enough to the world in watching all of the joggers and bikers coming through the gate just outside the residence. The house manager Teresa was very accommodating even with our few lost emails (technical problem). Near enough to surrounding towns where we could drive over for a pint and a bite to eat. Having such a beautiful and cozy place to come back to at the end of our daily adventures was wonderful. Would definitely stay again! Thanks so much, Irish Landmark, for providing such an awesome space! Thank you so much for your wonderful feedback, we are so glad you enjoyed your stay, it's always nice to hear what our guests think, would love to see you back in the near future. Life is possible without television and wifi. A radio was supplied. We did bring a small TV to watch DVDs though!!! Thank you for taking the time to write this review and for the comments, really delighted you enjoyed your stay, come back again soon. My wife and I were in Ireland for a 14 day vacation and stayed at the Batty Langley lodge toward the end of our trip. What a gem! It was relatively easy to find (not being from Ireland), clean, and cozy. The only complaint that we had was that it is not very private. We didn't have any issues but the website does not tell you that the gate by the lodge is the entrance to a large estate that is public. There were people constantly walking, running or taking their dogs for walks essentially right outside the door. We had several people look into the windows to see inside not knowing that people were staying there. Of coarse they meant no harm but we were under the impression that it was a tad more private than what it turned out to be. It still would not be a deal breaker for staying there because it is very lovely but it would have been nice to know ahead of time. Other than that no complaints and we would love to try more locations. We had a great stay! What a lovely property. The Batty Langley Lodge is beautifully equipped for a couple to relax and enjoy themselves in the beautiful setting of Castletown House. The kitchen has everything that you will need for preparing meals weather it be a light breakfast or a full dinner. The living room area is attractive with wonderful light from the gothic windows and the fireplace is ready for you to enjoy a cozy fire. Lot's of books are available and there is a good amount of information on the property as well as the extensive renovations that took place. The bedroom is on the second floor and is spacious with nice bedding. The second floor is also where the full bathroom is located. The Batty Langley Lodge is a unique property and I am thrilled to have been able to stay there in such comfort. The property is on the grounds of Castletown House and you will have people walking around very close to the house. People will also sometimes be looking in the windows which can be a bit of a shock but it is easy enough to pull the blinds or drapes during the busy times if you are concerned about privacy. All in all enjoyed the grounds, the beautiful setting and the comfortable stay and I would recommend it as a lovely place to stay. We stayed with kids,absolutely loved the house & park..Loads of books to read ,even bat detector to keep kids busy :-) didn't miss the wi-fi or tv ..very busy around the house..have to keep all the curtains on to get some privacy as people literally look in constantly & hang around at the house..
Glad you enjoyed your stay, thank you for taking the time to write this review, come back again soon. This was absolutely lovely; we enjoyed the lovely location on the restful estate and the care that had gone into furnishing the property while not stinting on modern convenience. Thank you for taking the time to write this review, really delighted you enjoyed your stay, it's always nice to hear what our guests think, come back again soon. Unique Property in Beautiful Surroundings with easy access to wherever you wanted to go. We had a wonderful holiday in beautiful surroundings. The property had a lovely atmosphere and the history of it made it an interesting stay. You only had to step out the door and you were surrounded by the parkland with lovely walks. The property itself was clean and tidy and the facilities were adequate, everything you could need was supplied. Thank you for your feedback, really delighted you enjoyed your stay, come back again soon. This property is at one of the entrances to Castletown House in Celbridge. It isn't a real gatehouse as the property looks inward onto the large park grounds of the house. We spent three nights here and had a lovely time. One day we drove to see the castle at Trim. Celbridge can be reached by walking through the grounds, which is very nice. The River Liffey runs along the park grounds and provided the opportunity to see heron and other wildlife. Another very nice village, Leixlip, can be reached by a short car ride. As others have mentioned, since this is at the entrance to a large park that's open to the public there can be quite a bit of foot traffic passing by. Delighted you enjoyed your stay, thank you for taking the time to write this review, would love to see you back perhaps at another magical Irish Landmark property. Myself and my partner had a very pleasant stay. It was for the most part peaceful, calm and very tranquil. Future guest however should be made aware that the lodge is attached to a public gate so there can be significant footfall. This did not bother us until our second morning when curiosity got the better of a number of passerbys who attempted to gain access to the property, knocking and trying to open the door and then peering in every window we can pulled the blinds on...a little frustrating but we laughed about it for the most part because it was such a relaxing weekend. Thank you taking the time to write this review, so glad you enjoyed your stay, would love to see you back perhaps at another one of our properties. We received landmark trust vouchers for a wedding gift from friends. It was a lovely break away close to Dublin. I am expecting twins so wanted to stay close to the city and not have a long drive. We loved walking in the grounds and visiting Castletown house. The lodge is very nicely restored but has all the modern comforts. We met relatives who live close by and had a lovely lunch in Barbarstown Castle. There is a lot to do in the area. The lodge is so peaceful and quiet. We particularly enjoyed seeing all the nature on the grounds. Thank you for taking the time to write this review, really delighted you enjoyed your stay,would love to see you back perhaps at another one of our properties. Staying a few days in the Batty Langley Lodge is a truly unforgettable experience. It makes you feel like staying in your own little castle. Especially when the gates of the Castletown House are closed we had the whole park area for ourself, with very nice walks and viewpoints - a dream for every photographer. Unfortunately before our arrival a silly boy had thrown a few stones into one of the beautiful windows, but the issue was solved by our very friendly and helpful contact Teresa the next day already, without any disturbance. We will be back - definitely! Wonderful retreat from the world. The Lodge is a marvellous retreat from the busy world. I love the location, only 1 hour from the madness of central Dublin. The best bit is when the gates are locked at night and it is all yours! Bat hunting is a great thing to do of a still warm evening. Thank you for your feedback, it's always a pleasure to let guests enjoy our properties, come back again soon. Enjoyed a great weekend stay at the lodge. Excellent location, especially for short walks. Used it as a base to travel to many other locations in Ireland and even managed a drive up the Antrim Coast on a loverly sunny day. Would recommend the property to anyone who wants a bit of seclusion and to get away from the crowds in the evenings. Thank you Nick and Faridah for your review of your recent stay at Batty Langley Lodge. Delighted to hear that you enjoyed your stay. Incredible you got all the way up to the Antrim Coast but it is certainly worth thr drive if ye are up for it. Deligthed you got the good weather for it. Hope to welcome you back to another Irish Landmark Trust property in the future. We spent three nights here. Fantastically peaceful despite being so convenient to Dublin. 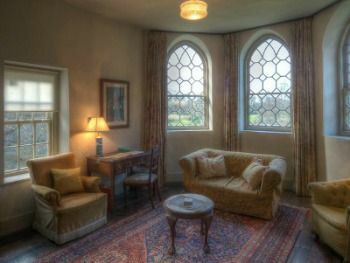 The Lodge itself was charming and comfortable with the added benefit of direct access to the Castletown House estate. This allowed the option of exploring further afield or just remaining in the little world of Castletown. Accommodation was almost as described which lead it to be given a 72% satisfaction rating by us. Beautiful residence of it's period and we enjoyed the experience but with three reservations. 1 the wood burner was not working and on the particularly cold week-end we stayed it would have certainly have added to our comfort.I would have thought that with it not working it would have been of significant interest to have us notified so that we might have been given the opportunity to re schedule.2 The stairs were verging on being dangerous and to someone like myself with a who suffers from arthritis it made for a hazardous ascent. 3 My wife and I thought the bed too hard and it really did prevent us spending our 3 and final night in property. I made these observations solely in the interest of feedback and I know by trying to be authentic modern standards cannot always be applied but point No 1 could have been rectified. Thank you for your feedback regarding your recent stay at Batty Langley Lodge. Irish Landmark buildings were made to the standards of earlier times. Consequently you may encounter features that reflect their particular character but that deserve due care and attention, particularly by the young, elderly, less mobile or visually impaired. Examples of these are steps worn with age, uneven surfaces, low ceilings and beams, unexpected drops or changes in level, and by modern standards low or absent lighting. In all cases we have sought to make a sensible compromise between due regard for safety and the careful retention of the fabric of each building, which makes it an interesting place to stay. Guests are notified of in the documents they receive when making a reservation but I do apologise that you felt unsafe during your stay. I have checked with Local House Manager regarding the woodstove and she has informed me that she is waiting to have it serviced and it was not recommended to use it in the meantime. I apologise that this information was not forwarded on to you prior to your stay. Perhaps if you contact me directly here in the Bookings Office if you wish to return to another Irish Landmark Trust property then we can advise you on what properties may be more suitable to your requirements. We had such a wonderful stay at Batty Lodge! Terrific location not that far from Dublin yet it felt a world and era away but with all modern comforts! Thoroughly recommend it and we will definitely be back! Thank you for such positive feedback, really delighted you enjoyed your stay, come back again soon. A wonderful feeling remoteness, even though lots of people cam and went through the large wrought iron gates beside Batty Langley lodge. Views of the river Liffey below the many windows made it even more special. The Lodge is perfectly equipped with everything you could possibly need, especially in the kitchen, and very rightly, there is no TV, wi-fi or radio. Its a chill-romantic nest for two. One sour note - some dog, or dogs, of which there are hundreds around the grounds at any one time, have picked the grass directly outside the front door to use as a toilet. Very off-putting. And nasty and unfair for Teresa to have to deal with. And do remember that the stairs are really lethal, although there are several large notices urging care along them. One other thing, and I don't imagine it would ruin the aesthetic of the Lodge too much. A small toilet downstairs, tucked away behind the Lodge or in the shed, or under the stairs would be a marvellous addition. A toilet and wash-hand-b asin would not cost all that much and would make such a difference. Everytime you need the bathroom you have to take your time, cautiously, up and down those stairs. Teresa was a lovely, friendly keyholder, punctual and welcoming, we couldn't have asked for nicer, she even presented us with a bouquest of flowers as we arrived! Despite unkind weather we had a wonderful time. Because of the cold weather we used a lot of heat and we found the fumes from the heating in the kitchen a little strong. Everything else was very satisfactory. Fantastic location, lovely walks and lots of things to do. Batty Langley is a lovely little property. It was great to be on the Castletown Estate and to be able to enjoy walks around the grounds. I would love to go back and enjoy a tour of the Palladian House and other nearby historical properties. February was not ideal for sightseeing in the area! The lodge is nicely situated for a quick trip into Dublin and was easy to find. The building is charming and we were warmly welcomed by the property manager Teresa. I enjoyed learning about the bats and about the restoration of the house. The property was as well equipped as any ILT house I have been to (4 now) and it's always a special experience to stay in a lovingly renovated building. The only downside was the number of adults and children coming up to peer in through the windows as I was having a quiet read in front of the fire on the Sunday afternoon. The charm and allure of this unusual building was clearly too much to resist!!. Thank you for taking the time to write this review, really delighted you enjoyed your stay, would love to see you back perhaps at another magical Irish Landmark. This house is very well equipped and furnished, comfortable and with a lovely view. Teresa the house manager and her husband Ciaran were very friendly and helpful. The bedroom and sitting room are lovely and very spacious - we were warm and peaceful while Storm Imogen raged outside - plenty of books! The walk across the grounds into Celbridge was great and Castletown House grounds are full of birds - thrushes, blackbirds and robins but also redwing, goldfinches, bullfinches, buzzards and best of all a kingfisher. Thank you for taking the time to write this review, it's always a pleasure to let guests enjoy our properties, would love to see you back perhaps at another one of our properties. We loved our time in The Batty Langley Lodge. 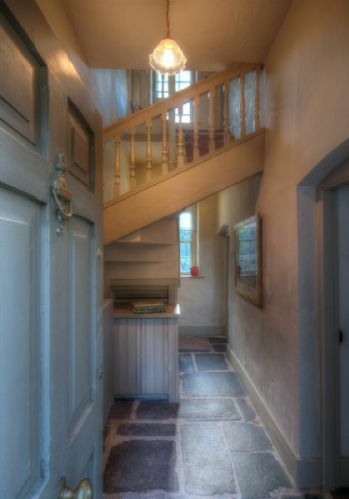 It is a beautiful property restored so sympathetically yet extremely cosy with every facility available. Bring your walking shoes as it is perched at the gate of an amazing estate free to explore. Thank you for taking the time to write this review, thank you for your comments , really delighted you enjoyed your stay at Batty , would love to see you back, perhaps at another one of our properties. We spent the first few days of 2016 in Batty Langley. We were fortunate that the rain held off while we were there, and it was a real treat to be the only residents on the estate, if only for a brief period. It's a gorgeous hide-out, beautifully decorated and maintained. The one crib we might have is that cars ignore the signs and continually park in front of the kitchen window - perhaps a few judiciously placed rocks would prevent illegal parking and provide a bit more privacy. Also, maybe some kind of barrier could be placed on the grass in front of the living room windows to deter people on the grounds from staring inside. But otherwise, we loved our short stay there. A restful stay in the woods. A cosy little house with everything one needs. Beautiful walks around the grounds of Castletown House. A romantic place with plenty to occupy one's time and mind. We spent a wonderful holiday at this sweet cottage. The park is marvellous and returning after a walk or a day trip felt like coming home. Hope to be back again one day for a relaxing holiday. The lodge offers all facilities one could wish for without losing the flair of the 18th century. Thank you for taking the time to write this review, really delighted you enjoyed your visit to Batty Langley Lodge , it's always a pleasure to let guests enjoy our properties. A step back in time, the comfort level was probably the best that can be expected balancing the realities of an 18th century building and the hopes for the 21st century traveler.A little bit bigger bed would have been a plus. Your representative Theresa couldn't have been nicer or more helpful. A great experience enjoying an historic property. Would definitely stay with Irish Landmark Trust again! Thank you for your feedback, it's always nice to hear what our guests think, really delighted you enjoyed your stay and would love to see you back in the future. Unfortunately my dad was ill so they didn't make it down on the Friday.They travelled down on the saturday to stay for one night as they were celebrating their golden wedding anniversary but found it hard to find the place and they tried to ring The host but could not get through so had to drive home again. I am sorry that your parents did not have the oppurtunity to stay at their chosen property. I find it surprising that they had difficulty finding the property as the directions they were sent are completely accurate. We always ask for guests to contact the Local House Manager at least 5 days proior to arrival in order to make arrangements to meet at each of our self-catering properties. I understand that your parents were unable to stay the first night of their stay and that they would travel down to for the second night. The Local House Manager was anxiously waiting for a telephone call from your parents on that day so she could travel to meet them at the property to welcome them but she did not receive a phone call and there are no missed calls or text messages so presumed that your father was still unwell to travel. We love Batty Langley lodge. This was our 5th stay at an ILT property and our 2nd stay at Batty Langley. Cozy, comfortable and romantic. Great location and only minutes from Cellbridge town center and the train station. Last year we were here in November and Castletown house was closed for tours. This time we did the tour and it was great. As far as our stay is concerned, everything was ready for our arrival. The heat was on, the lodge was comfortable and the fireplace was stocked with wood. Kudos to Teresa who made our stay perfect. We will be back! A wonderful stay with sunshine every day and no rain at all! This property is so well located in an area full of interest. We much enjoyed wandering around the park and visiting Castletown House. 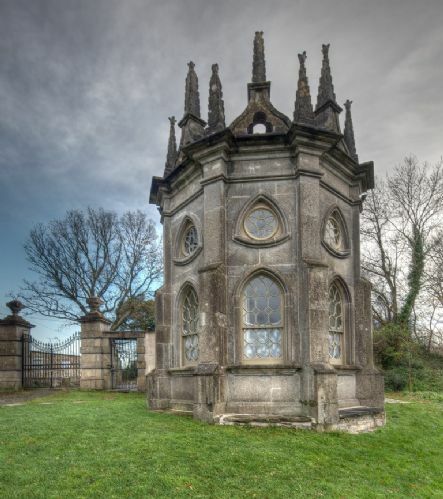 Also Maynooth and its castle and university, Leixlip with a visit to Desmond Guinness's Castle, Carton House with an arranged visit to the Shell House and walks through its splendid grounds. Ate in every night from local produce and fully enjoyed the comforts of the Lodge. Teresa was so welcoming and accommodating giving us an hour extra on our leaving morning for one last walk round the park. Thank you for lovely feedback,so glad you enjoyed your stay at Batty , come back and visit again soon. The lodge is wonderfully situated above the river. The interior and its furnishings are a well curated collection of very appropriate bits and pieces. No TV, or Wi-fi make it a perfect retreat from the modern world outside. Once the gates are locked for the night it feels as if the park is all yours. I really enjoyed going out with the bat detector along the river bank at midnight. Do come and relax here! Thank you for taking the time to write this review, we are so delighted you enjoyed your stay at Batty Langley , thank you for the lovely comments, come back again soon. The bed was very comfortable and the location so relaxing. This was just what we needed as we have a difficult time ahead of us now and our special time at Batty Langley was just what we needed - when we were there we forgot all our worries. Really delighted you enjoyed your stay at Batty Langley Lodge, thank you for the lovely feedback, it's always nice to hear such good comments, would love to see you back perhaps at another one of our properties. aaaaaaaaaaaaaaaaaaaaaaaaaaaaaaaaaaaaaaaaaaaaaaaaaaaaaaaaaaaaaaaaaaaaaaaaaaaaaaaaaaaaaaaaaaaaaaaaaaaaaaaaaaaaaaaaaaaaaaaaaaaaaaaaaaaaa great place to be! Thank you for this review, delighted you enjoyed your stay. The lodge was very cute accommodation for two. Just inside the grounds of the park gives opportunities for walks to Castletown house (recommend the cafe) and cellbridge (recommend the Village inn). A car is essential for other trips. Directions could have been a little better, but maybe the new postcode system will help. Be prepared to be cut off as no TV or WiFi and phone reception ok/patchy. Nevertheless that was exactly why it was charming and a quiet getaway. Thank you for this review, delighted you enjoyed your getaway at the lodge , would love you to come back and stay with us perhaps at another one of our properties. Thank you for this review and suggestions , we will keep them in mind, glad you enjoyed your stay. Amazing property in beautiful location. Thank you for your feedback, so glad you enjoyed your stay, it's always a pleasure to let guests enjoy our properties. A delightful and charming 'Gothick' lodge. We really enjoyed our stay. It is a perfect location for peace, quiet and tranquility. Our spaniel also loved the location - plenty of walks on the doorstep. The lodge has a great view of the Liffey. In addition there is a modern kitchen with plenty of cultery and crockery. The lodge manager, Teresa, is very helpful. I suggest the stairs and shower/bath may be difficult for someone who is not too mobile. Thank you for taking the time to write this review, so glad you enjoyed your stay, it's always a pleasure to let guests enjoy our properties. My sister and I (Golden Oldies) enjoyed a lovely few days in Batty Langley Lodge. It was what we expected it to be - comfortable, warm, well-equipped - yet maintaining sufficient antiquity of old-world charm to conjure up a vivid enough image of what 'living' was like (for privileged classes!) in those far-off days. There were plenty local historical books on the shelves, as well as some old favourites like Yeates, Macken etc. A trip down memory lane! All the kitchen equipment was modern and worked perfectly and there was lashings of really hot water. Teresa, the Manager/Caretaker, an delightful lady and an absolute asset to "Batty", warmly welcomed us, facilitated us in every way, and was very apologetic that the log/turf-burning stove was temporarily out of commission. We missed a little lazy 'loll' in front of that, but, however, the central heating was more than adequate. Teresa had placed a vase of beautiful fresh flowers at the kitchen window to greet us...what a lovely gesture! The bed was comfortable and the bedding good quality. The bathroom was fine and everything worked well and was spotless; I would have liked a brighter light in there. Great care must be taken on the stairs as the riser-heights are somewhat uneven. A quiet and peaceful hideout is Batty Langley's where tranquillity reigns. People we met out and about were friendly and nobody came to peep in our windows!! The Castletown Estate lands are glorious - no bats in evidence anywhere, but we did see some squirrels hopping from tree to tree. We also loved the Cowslips and Primroses which we spotted in all their glory...wild and free! All in all, this was a lovely little sojourn rubbing shoulders with the 'Big House'. We hope to do a Tour of that when in Celbridge as we have already booked to stay in the Round House there. 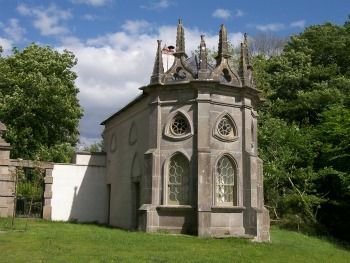 Best wishes to the Irish Landmark Trust and its endeavours. Delighted to hear you had a nice time. You were there at perfect time of year to see all the Cowlips and Primroses! It was so lovely to have you stay and I look forward to chatting to you again and arranging another stay for you. the setting for Batty Langley is lovely, with all of Castletown Demesne at your disposal - ideal for a lively 3 year old and dog. The house was very comfortable by the Saturday afternoon but was quite cold, particularly the bedroom which felt cold and a little damp on arrival on Friday night. If heat had been on a little earlier it would have helped - this is the only difficulty we experienced. Thank you for taking the time to review your stay, so glad you enjoyed your time at Batty Langley, thank you for your notes on the heating we have forwarded them onto the house Manager. The welcome from Teresa and Ciarán was as warm as the fire they had lit in the living room. 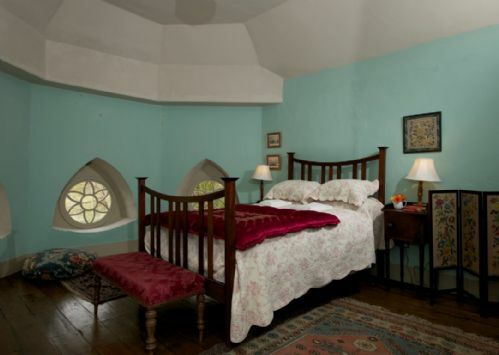 The house is idyllic - Like something from Lord of the Rings, particularly the bedroom. We woke to the tweeting birds. 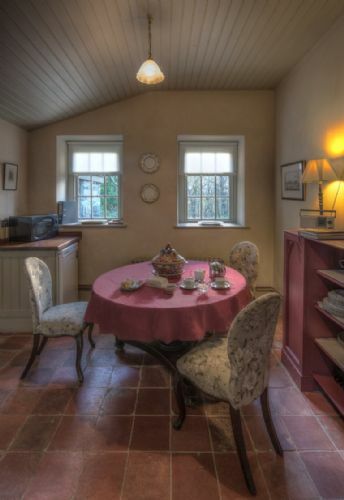 The kitchen is quaint, but is fully equipped - dishwasher, oven, hob, fridge, microwave, pots and pans. The house feels very secure as there is an infra-red CCTV camera on the main gate to the grounds. There is parking to the rear of the house too. There is a great Supervalu a mere 1.5kms away and a petrol station for anything you have forgotten. Max our little dog loved meeting all the dogs that came through the gate. Make sure to visit the Main House (Castletown House) which is truly spectacular - I never knew Ireland had such grand residences. Walk off a big dinner with a stroll by the river - glorious! Thank you for a wonderful stay. We will be back. 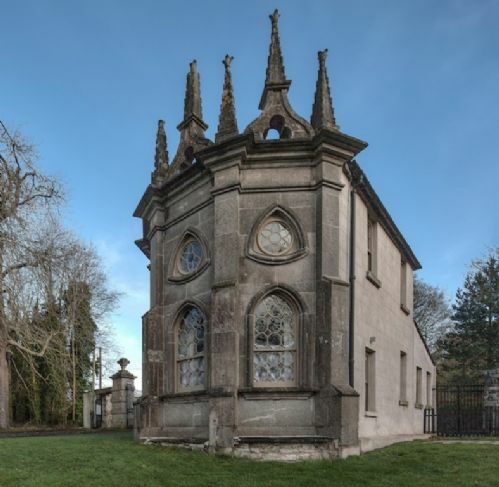 Another wonderful property of the Irish Landmark Trust. Great location. Clean and well kept. It lived up to our expectations. Enjoyed the walks in the surrounding grounds. Well worth a stay. Wonderful New Years at Batty Langley! Had a wonderful New Years at Batty Langley and what a fantastic place to ring in the New Year!! The Lodge is cozy, comfortable, warm, and full of fantastic character! Teresa, the house manager, gave us a warm welcome and was kind enough to let us arrive early and stay late. Even though the Lodge retains all of its original character, it is still full of modern conveniences like a dishwasher and laundry machine. The oven was also one of the best we've experienced in the Landmark buildings, so we were able to cook some fantastic meals there. The grounds surrounding the lodge are beautiful and great for walks by the river, or by the lake with the swans, as well as the large estate house on the property. Others have commented about the public peering into windows, and while we did not have that experience, there are quite a few people walking around the estate when the gates are open. Everyone respected our privacy so it did not impact our stay at all. And, if you are lucky enough to be staying there when the daylight lasts longer, the gates are closed at 7:30, so you will then have the entire estate all to yourself. Its quite a priveledge. We would highly recommend this lodge to couples and we cannot wait to return for a longer stay! Thank you for the wonderful feedback, delighted you enjoyed your stay for New Years , it's always a pleasure to let guests enjoy our properties, would love to see you back in the future. Beautiful location, gorgeous walks through the grounds of Castletown House. The lodge itself was cold on arrival as I think it had been empty before we arrived but with heating on and a roaring fire going it was lovely. Delighted your stay was cosy, thank you for the feedback, it's always great to hear such nice comments. A super place . I want to return in summer . It's special historical and a really interesting place. I would love to see other landmark trust sites now this has been my first time staying in a magical place . Excellent stay at Batty Langley! a three night stay here. It was excellent. Our hosts were fantastic and the stay was awesome. The entire property was beautiful but staying in the gate house was one of the highlights of our trip. Earlier in our trip we stayed at another landmark trust property and it too was awesome. We will be back! For a quiet getaway, this is the perfect place. with a short walk to the village everything is nearby, but the lodge itself is secluded. We spent three nights in the beautiful Batty Langley Lodge on the Castletown estate. The building has been sensitively restored, while at the same time including some welcome modern additions like toasting central heating. We visited Castletown House and I very much enjoyed a guided tour of the amazing house. We ate several times in the restaurant. We were also lucky to be able to attend the monthly country market which coincided with our stay. However, the house and restaurant close for the Winter on the 31st October every year and I would have been sorry to miss them. Staying here is a truly unique holiday experience, you'll have to try it! Thank you for the wonderful feedback,it's always a pleasure to let guests enjoy our properties. We loved our stay! We felt like royalty, especially when we strolled the grounds after the gates were locked and we had the whole place to ourselves. Enjoyed Castletown and the town of Celbridge. Thank you for this review delighted you enjoyed your stay. We had a great visit. Location was fantastic with access to both Dublin and the countryside. Really enjoyed the 'history' of the place. Fireplace was a big plus on cool evenings. Very interesting property which is well restored and well kept. The housekeeper was most helpful. The location is excellent within walking distance of many attractions. A very good weekend. Batty Langley is a magical experience. We were greeted by Ciaran who was very helpful and pleasant. The lodge is a perfect romantic getaway from it all, and the walk from the lodge to Celbridge town through Castletown estate grounds, is just fantastic. One of the best weekends away I have had in a long time, would highly recommend it. The fact that there was no internet or TV is definitely a plus. The only downside to this property is the fact that the shower in the bath is not hung on the wall and must be hand held. Other than that, the property couldn't be better. Thank you for this review ,we will take into account your remark and will work towards improving it. had two nite stay at batty,would buy it if allowed.teresa (caretaker) lovely lady,well suited to the job. will bring fishing rod next time !.great location for touring Dublin,kildare and meath. A lovely respite from a busy holiday. The lodge was a wonderful place to end my first visit to Ireland. The lodge itself is comfy and restful and the grounds are beautiful. I can't think of a nicer place for a little rest and relaxation. Thank you! Delight you enjoyed your stay, thank you for the lovely feedback,would love to see you back in the future. Stayed in the Batty Langley Lodge for three nights/four days. The accommodations were historically wonderful, and the grounds were great to stroll around in the day or evening. The kitchen facilities were more than adequate to prepare any meal you cared to cook. Groceries were close by, but you definitely need a car if you are going to stay in this place for any length of time. The bed was comfortable and the bathroom facilities were fine. With no wifi or TV this can be a very restful and relaxing stay. The Castletown House is certainly worth a look. The city of Celbridge has several restaurants and bars of varying levels of quality. All in all a great getaway! The only complaint was the lack of hot water, the immersion heater would not cooperate with us at all. Nice house with a beautiful view. The Batty Langley Lodge is a great property for your money! The cozy setting of the house wil make you feel at home when you first enter the doorstep. Lots of interesting culture is only a short drive away as also the beautiful nature of the Wicklow Mountains. The house has every luxury features you would expect from a great holiday home. On days with nice weather, the bumpy road to the house was packed with parked cars of locals visiting the park grounds, which made it a challenge to reach the on site parking lot. We had a really great stay! Thank you for this lovely review, it's always a pleasure to let guests enjoy our properties. We really enjoyed our stay at Batty Lanley Lodge. The perfect unique relaxing getaway from our busy Dublin lives. Fatastic history behind the lodge and the sourrounding land. We did a very enjoyable tour of Castletown House itself which gave us a good insight. We enjoyed nice walks during the day despite unfavourable weather but nothing a nice cosy fire couldn't sort out. Was fun to find a BAT detector in the lodge and read up on the history of bats and surveys carried out in the area but we weren't lucky enough to hear any during our stay. It certainly added to the Gothic feel of the lodge. Unfortunately privacy was an issue at times though with cars parking right outside the kitchen window from early morning to late at night despite signs on the gates and also people exploring the area would peer in the windows of the lodge, once catching us unawares while having dinner. In saying that you must bear in mind that it is a public area and is a very popular area for walkers, runners, cyclists and tourists alike so there is a constact flow of people about the place. We thoroughly enjoyed our stay and look forward to our next Irish Landmark stay already in September. Thank you for taking the time to write this review! I'm glad to hear you enjoyed your time at Batty Langley and that you visited Castletown House itself. I'm sorry to hear about the issues you had re. privacy and will look into getting better signage done for the lodge - this may help. Looking forward to having you stay again in September! We loved our stay at the lodge. The weather and the house were beautiful and we were made feel very welcome. I would recommend staying here to anyone! I stayed at the Batty Langley Lodge over the weekend. By car it took us 30 minutes from the airport - very convenient. It is well situated and the surroundings are extremely beautiful. Glad your stay was amazing, thank you for the feedback. Come back soon. Batty Langley Lodge is such a lovely place to stay. The house itself comprises a large bedroom with en-suite, a large living room and a well equipped kitchen. While it's not 5-star accommodation, it's got a lovely character and the rooms are all really lovely. We particularly enjoyed the living room with its excellent fireplace stove - many an hour was spent in front of it. The grounds surrounding the lodge are very beautiful too, and we had some great walks around the Castletown estate. On the Sunday of the weekend we were there, an excellent country market was taking place beside Castletown House. So all in all, well recommended! Thank you for this review, delighted you enjoyed your stay. Hope to see you back in the near future. We had a 2 night stay at the lodge. Location was perfect, the only downside was the quality of directions given and the lane leading to the lodge was awful, it would actually put us off going back, given the fact that we were worried that our car would be damaged from driving over the huge muddy craters on the lane. Also, the patch up work done on the bedroom ceiling seemed to be sub-standard. It certainly didn't appear to be sympathetic to the original design of the ceiling! The caretakers were extremely helpful and the book on the history of the house which they bought was fascinating. We will be back to Castletown House for a visit with our extended family in the coming weeks. The lodge itself was perfect for our requirements, we had a lovely relaxing stay. Thank you. Mary & Harry. Thank you for the feedback,we appreciate you taking the time to let us know of the issue. Hope to see you back soon. quaint unique building.location very scenic at entrance to estate but laneway into lodge is in a deplorable condition. house cold on arrival but heated up quickly once heat was turned on .bedroom in good condition but does need paint to cover dampness etc. bathroom small but no excuse for poor shower facilities. sitting room excellent with great comfort i.e stove , and lovely views to river and estate. overall it would be a good location to stay except for the above comments. darina in the booking office was most helpful. Thank you for the feedback,we appreciate you taking the time to let us know of this issue and will work towards improving the situation,looking forward to seeing you in another Irish Landmark again. Absolutely faultless. We had a fantastically relaxing break, walking for hours before settling with peat fire & a book. The house itself is beautiful, the setting perfect. Thoroughly recommended. I would suggest the approach road (in particular the Area nearer to the Lodge) be looked at. There are holes big enough for a car wheel to fit into - presumably facilitated by the recent bad weather - but the area closer to the newer houses was not nearly as bad. Thanks for the feedback,we will take into account your remark about the pot holes. it all. We Loved our time there. Glad you loved your time at Batty Langley lodge. Thank you for your feedback. hope you stay again soon. Batty Langley was cosy, peaceful and perfect for a weekend to get away from everyday life. The house manager is lovely and flexible and made sure we had enough of everything (including logs for a great fire). The lodge is set in the grounds if Castletown house which made for lovely walks, especially to the town of Celbridge which is full of lovely little pubs. Overall a really great experience. Batty Langley Lodge was the perfect Christmas escape. We loved the quirkiness of the house and the setting, on the edge of Castletown was great for lovely walks with our dog. We hadn't anticipated the number of other people who would not only be out walking in the estate but looking in through the windows of the Lodge. We did feel slightly like we were in a goldfish bowl! Perhaps a small fence around the house might act as a deterrent to would-be viewers and ensure privacy for future guests. Hi there, thank you for sharing your feedback and we will definitely take your suggestion into consideration. Glad to hear that you and your dog enjoyed the area. Glad to hear that you enjoyed your stay! Thanks for the review. I recently stayed at Batty Langley to use the premises for our photoshoot, the lodge is amazing. I would definitely recommend it. I will try and get back for a personal visit! Thank you for sharing this beautiful photo. We hope to see you for your personal visit in the near future. Take care. I took my boyfriend to the Batty Langley Lodge for his birthday, it was amazing! The walking grounds around the main house were beautiful even in November. The bat detection equipment was fun to play with as well, even though we didn't hear any. The book about the family who owned the main house was fantastic, read it if you have the time! Overall...Highly Recommended! Thank for your comment. We are really delighted that you enjoyed your stay in Battey Langley Lodge. We would love to see you again perhaps at another one of our properties. Kind Regards.